This will be her first Mother’s Day so I wanted to make it special for momma. 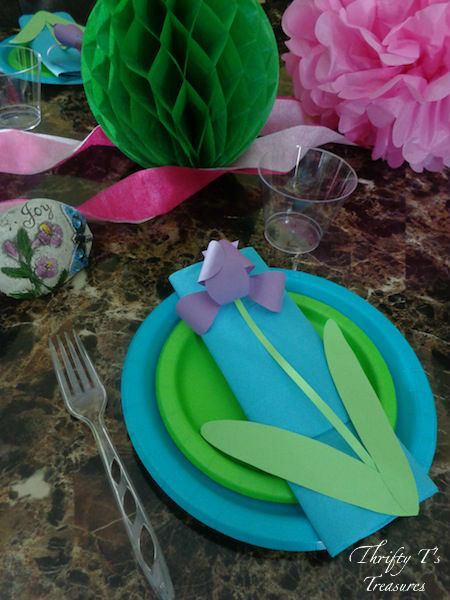 My plan was to create a fun dinner party for her and daddy. Momma has a book where she keeps creative ideas that she’s pulled out of magazines. 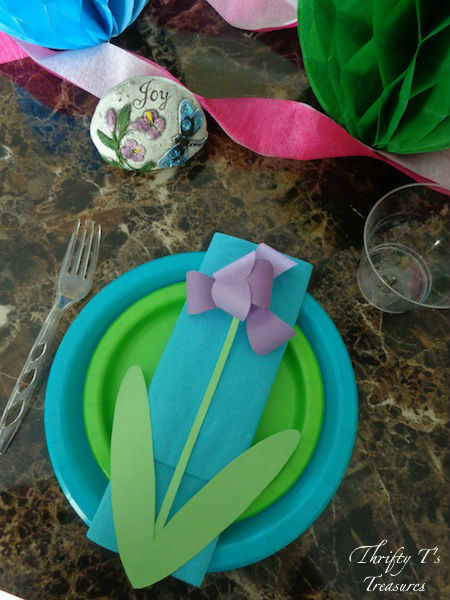 I’d seen some DIY Paper Iris’ and knew they would be perfect to top off their for their place settings! 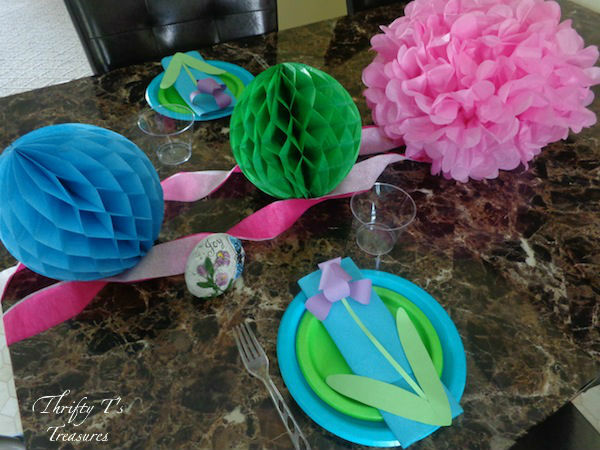 Although I wanted to keep the dinner party a surprise I couldn’t because I needed momma’s help. So, we headed right down the road to Dollar General! This wasn’t my first trip to Dollar General. 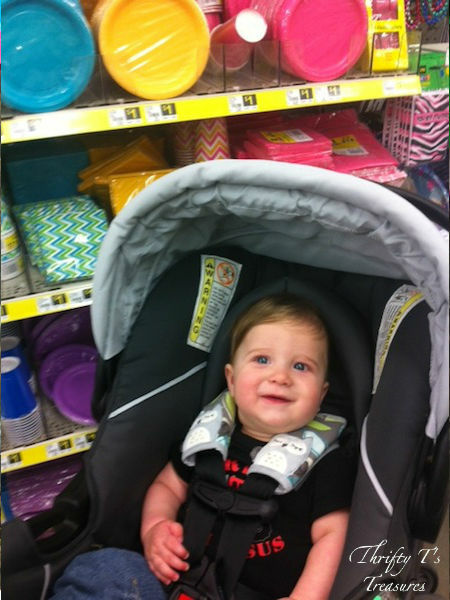 We actually go there quite often because that’s where momma gets my diapers and other items we need around the house! 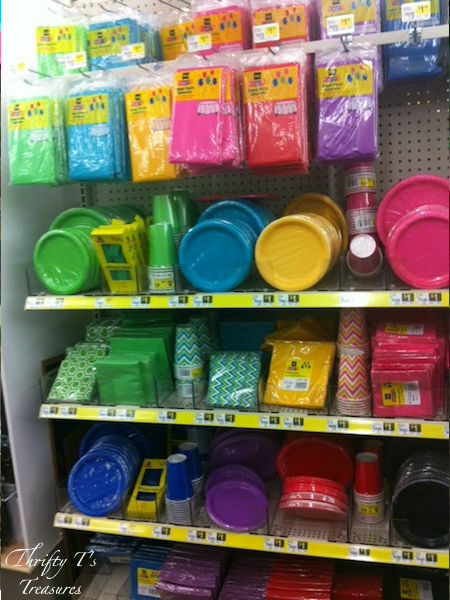 They had a great selection of bright colored plates, napkins, and tablecloths that were perfect for my party (or any summertime party, really)! I couldn’t decide which colors I liked best so I asked momma what she liked. After all, it was her party and I wanted her to like it! 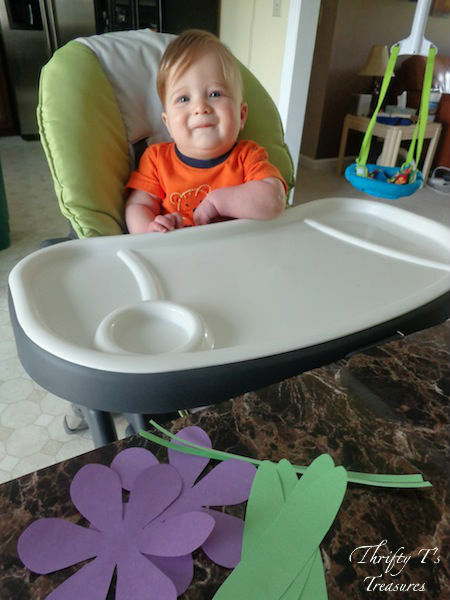 Once we chose the plates and napkins it was time to get table decorations. What’s a party without decorations, right? Not only did they have some cool looking balls (they’re actually called Honeycomb Tissue Balls), but they also had ginormous Puff Balls and more! They were made to hang but I liked them sitting on the table. I could see that momma was pleasantly surprised at the selection of serving trays they had…and at an awesome price too. Although we didn’t need any for this party, I could tell that she was storing away the info for upcoming events. The look on momma’s face when she saw it was exactly what I was hoping for! She loved it and couldn’t stop smiling! Since I’m too little to use the oven and cook, my job was done. It was up to daddy to come up with some fabulous food for my Mother’s Day celebration. I have no doubt he can handle it. 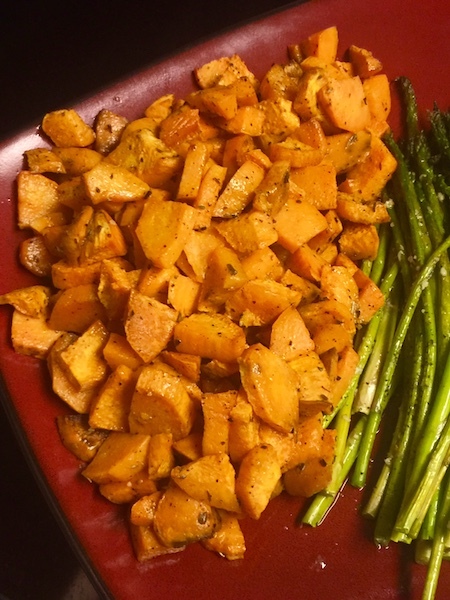 After all, I’ve been told that he makes a mean Poppy Seed Chicken! 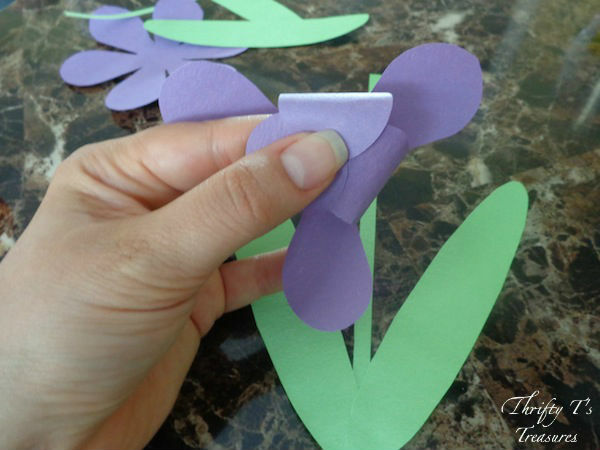 Put a little bit of glue on your stem and attach your first petal. 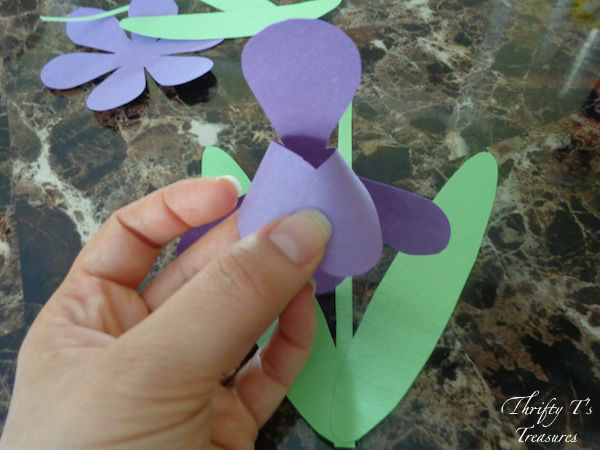 Lift every other petal (three total) and glue together at the tips, overlapping slightly. 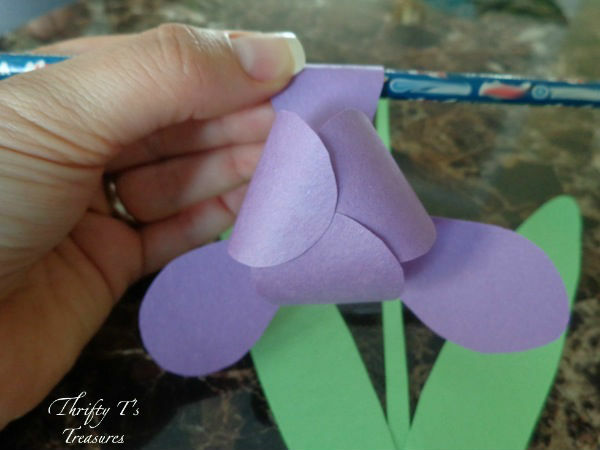 Using a pencil, curl the remaining petals downward by wrapping them around a pencil. 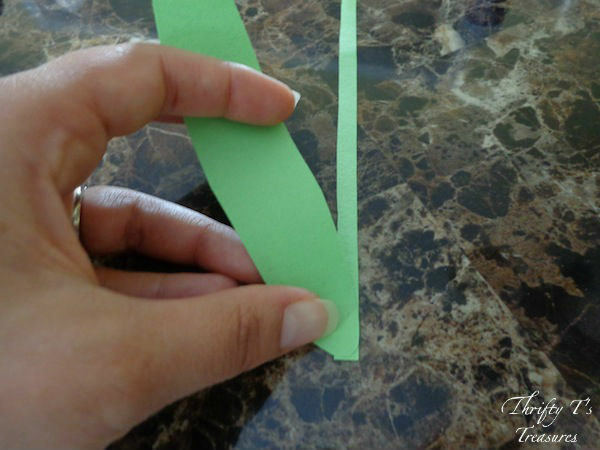 Glue the flower to your stem. 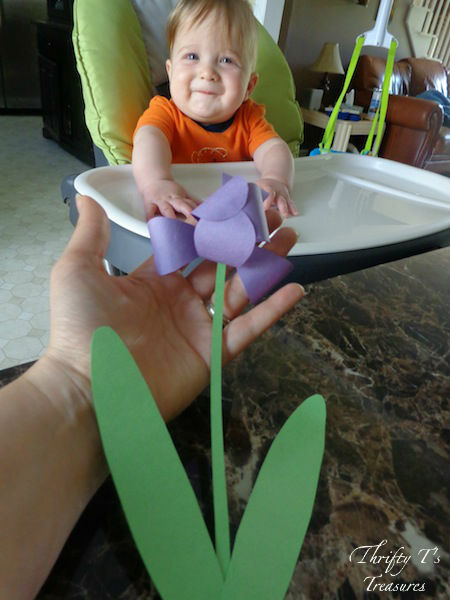 And there you have it, your very own DIY paper Iris! Your party guests will love these place cards. 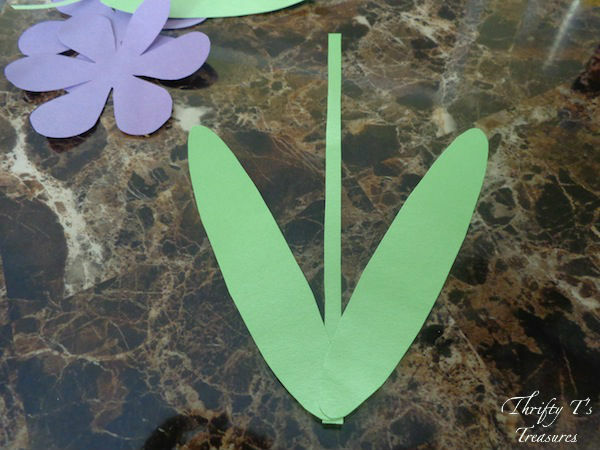 To add a personal touch, write their names on the leaves. Under my supervision, momma followed directions well and did a great job! Wouldn’t you agree that we make a pretty good team? Maybe next time I’ll be able to do it all by myself! 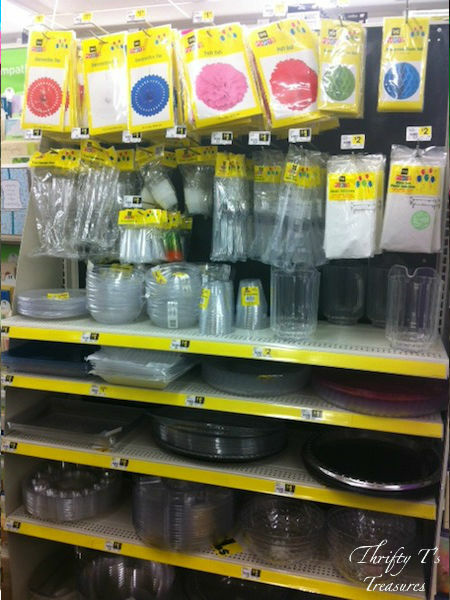 The next time you’re in the market for party supplies, I highly recommend that you check out the steals and deals at Dollar General. We’ll definitely be hitting them up for our next party! Such a cute post! Love the Mothers Day gift idea and Dalton is getting so big! Pinned to my Mothers Day board. Ah, thanks Melissa! I definitely had a blast with it. 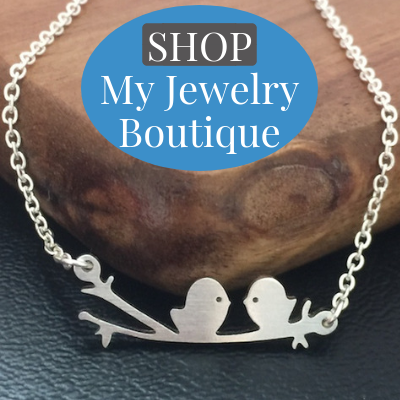 Thanks so much for pinning and sharing it!